Planning for a wedding can be overwhelming! But, don’t overlook a very important part of the celebration – food safety! 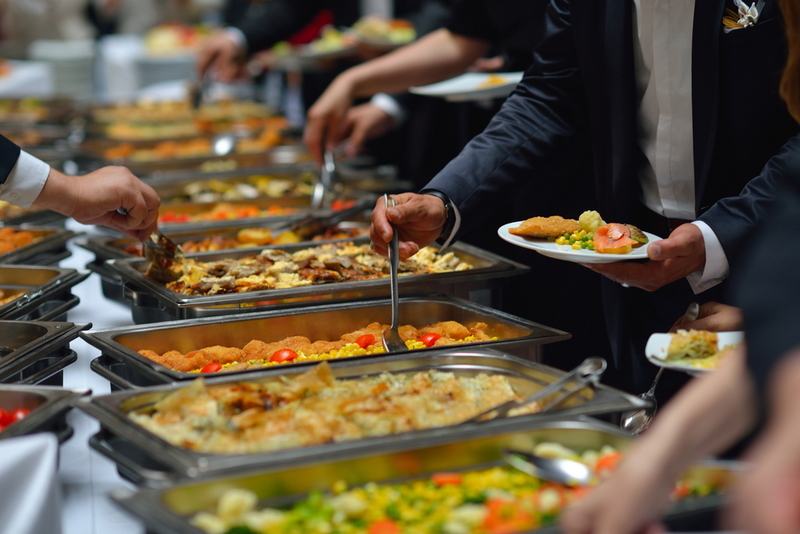 Whether you’re having a wedding reception catered or are self-catering, proper food safety principles will help ensure that your guests leave with only happy memories and not ones that could leave them sick or even land them in the hospital. 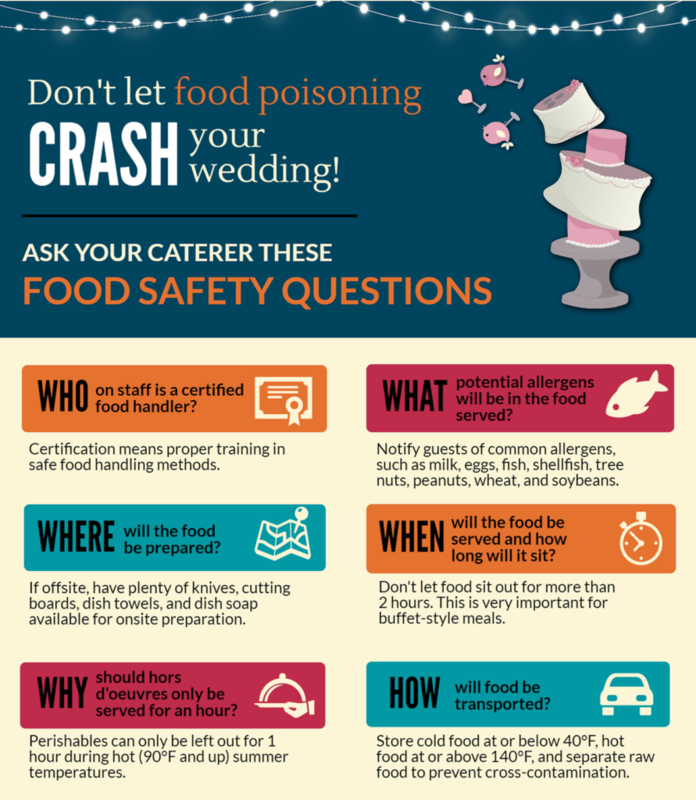 Likewise, to help prevent food illness from happening at your wedding reception, it is important educate yourself on food safety and do some research into your caterer for the big day. 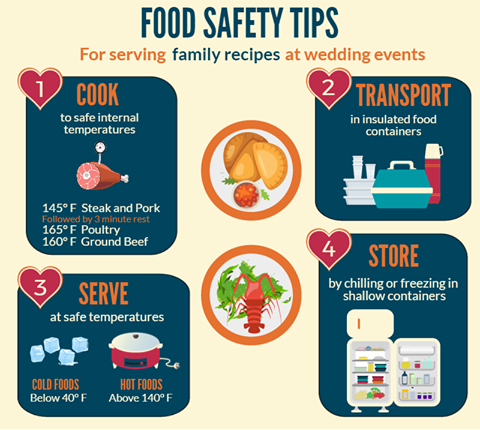 There have been numerous stories of wedding dinners where guests left with a foodborne illness, putting a large damper on what should have been a happy memorable day. 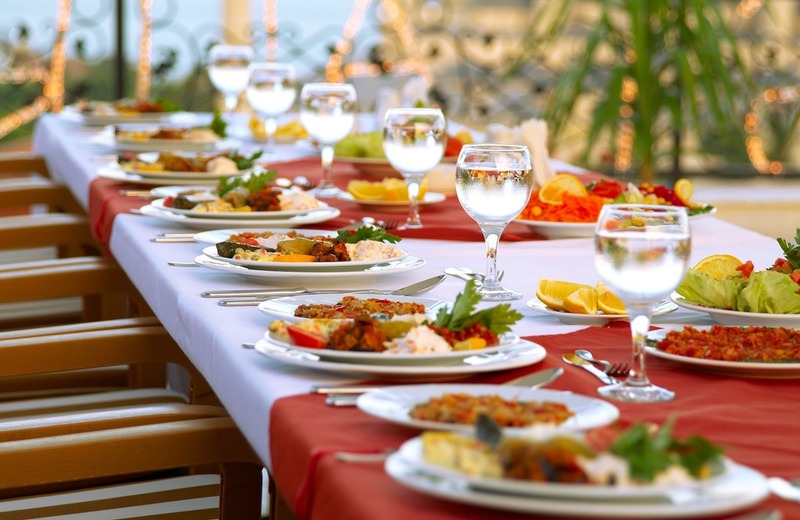 In 2014, 74 out of 190 guests at a wedding reception in Rhode Island fell ill with gastrointestinal symptoms. Norovirus was later confirmed through diagnostic tests. In 2014, more than 300 guests were sickened during a wedding in Sullivan, Mo. after consuming gravy that was not cooled and reheated correctly. That allowed Clostridium perfringens, a bacterium that can be harmful to humans, to develop, leaving guests with abdominal cramps and diarrhea. 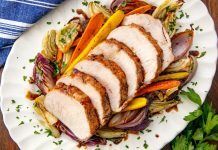 In November 2016, 100 people became ill with salmonella gastroenteritis, after consuming chicken at a catered wedding dinner in Alabama. 22 of these people were hospitalized, the catering company surrendered their food service permit and was put out of business. These stories are not something you want people to remember about your wedding. Nationwide, the CDC estimates 48 million people get sick, 128,000 are hospitalized, and 3,000 die from foodborne diseases each year. To help prevent that from happening at your wedding, it is important to put some research into your caterer for your big day. 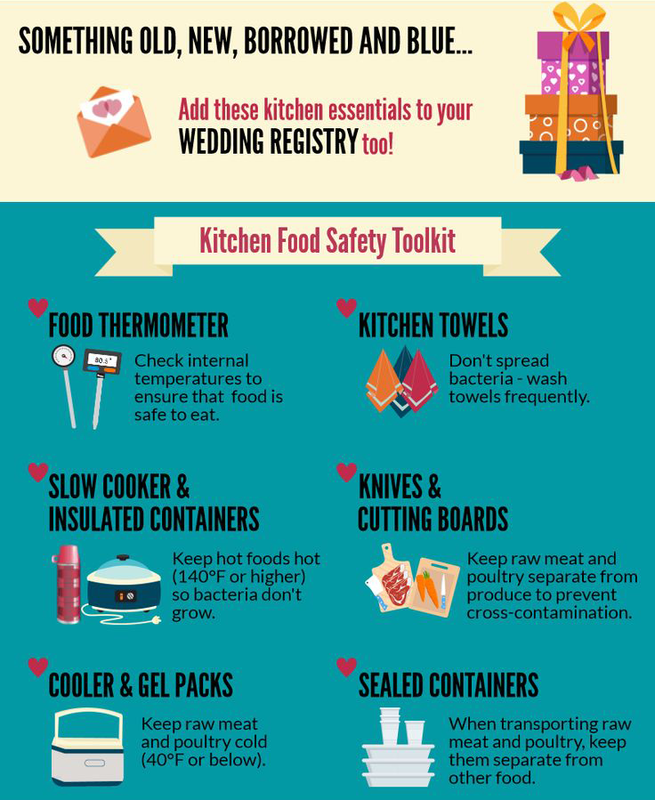 Do you know the temperature to keep food safe at your reception or party and prevent food illness? 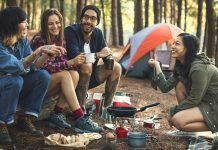 It is important for people to become educated and understand which negative behaviors and activities can contribute to the safety of food and foodborne illness. To help prevent food illness or poisoning, look for caterers who have a food safety certification for kitchen managers and food handlers, to make sure they’re properly trained in safe food handling methods. Who are the staff members certified food handlers? 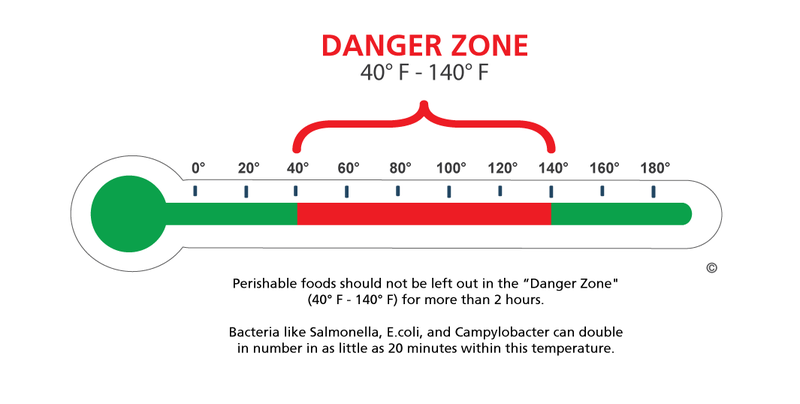 The Temperature Danger Zone is the temperature range between 40°F and 140°F. 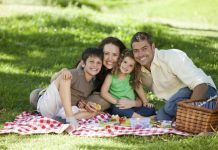 At warm temperatures, 60°F and above, bacteria that cause foodborne illness can begin to multiply. At temperatures of 80°F and above, they multiply rapidly. While foodborne illness usually means uncomfortable intestinal flu-like symptoms, it can be serious for young children, the elderly and persons with chronic illnesses. If your family decides to cater the event themselves, consider reviewing the FSIS publication, Cooking for Groups (PDF). It offers guidelines on preparing large quantities of food. Do not use utensils on cooked foods that were previously used on raw foods. Chill foods promptly after preparing and when transporting from one place to another.